Imagine having the first three entries on the first page of Google for a search term that drives qualified leads, imagine having the first five. As part of our ongoing SEO and content marketing services for our customers, we focus on searches that we believe will deliver qualified leads to our customers. Leads that will turn into appointments and revenue. That is the constant focus of our efforts. Our customers are all Independent hearing healthcare professionals with their own Practices. That is who we set out to assist when we launched the company and our services. I was intimately aware that Independents internationally felt under pressure. Many consider it difficult to compete against the big player's deep pockets for marketing. I believed that they didn't need to, I have thought for years that smaller businesses needed to market smarter, not spend more money. I also believed the battleground for prospects should be the internet. So we set out to prove it. We know that every penny spent with us needs a return and a pretty quick one. So we have consistently gone after low number but qualified local searches with strong SEO and content for our customers. The search phrases we focus on are long tail phrases that we believe will lead to appointments. The search patterns (times the search is undertaken) aren't huge, but there is more than ten each month and they are focused searches. These searches are undertaken with intent, we believe they are undertaken by qualified prospects who are either ready, or close to ready to make appointments. We believe that this is the best way to deliver leads to our customers. Prospects want information, at the end of the funnel, they tend to search what we call qualified search terms. We have been working on them for some time, gathering analytics and running experiments. That strategy is paying off. One of the search phrases we came across was Best hearing aids *an area*. Again as I said, the search patterns aren't enormous but we think that the searcher is reaching the end of the funnel. They know they have a hearing loss and they are undertaking research on hearing aids. In fact more than that, they are researching hearing aids in their area. These people are either ready or close to ready to make an appointment. We focus on other qualified searches or searches with intent in our customer's areas as well. For instance searches for particular manufacturer's, invisible hearing aids and earwax removal. We believe each of these searches is undertaken by someone ready to do business. The search activity on these long tail phrases isn't huge, but we believe it is highly targeted and qualified. Worcester is seeing some excellent conversions to an appointment on these searches when we can track them through the analytics. Without boring you, we know that there are similar results across a number of our sites. What is really interesting for us nerds is that we have never seen multiple entries for one business site on a search, except when you undertake a brand search. For instance, if you searched Worcester Hearing Centre, you would see a page full of entries from that site, but that is a brand search. In fact, if you know of other examples, we would like to hear back from you. Targeting qualified but low number searches is something that we do very well, we focus on them because they deliver enquiries, enquiries deliver appointments and our customers convert those to revenue. Even earwax removal appointments can be converted to hearing aid sales, certainly not all of them, but enough to make our customers happy. Time for you to focus on localised qualified searches? We have shown that focusing on localised qualified searches will pay off, it does for our customers and it can for you. 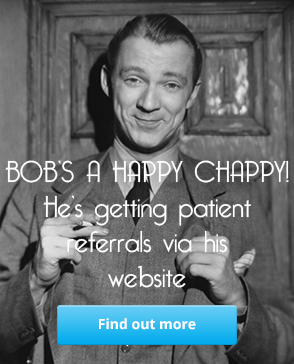 Tom from Worcester Hearing Centre has quite happily told us that his revenue has increased by 25% and it is directly attributable to the website. It just needs some thought, a little strategy and a bit of well-written content. Maybe it is time that you focused on qualified prospect searches too.